When you are visiting a city, do you attend a local sporting event? We did. 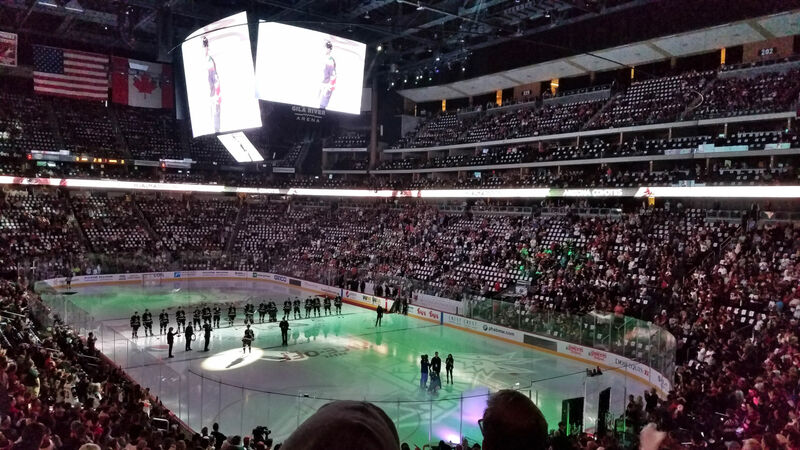 We attended the Arizona Coyotes Hockey opening night game in October. 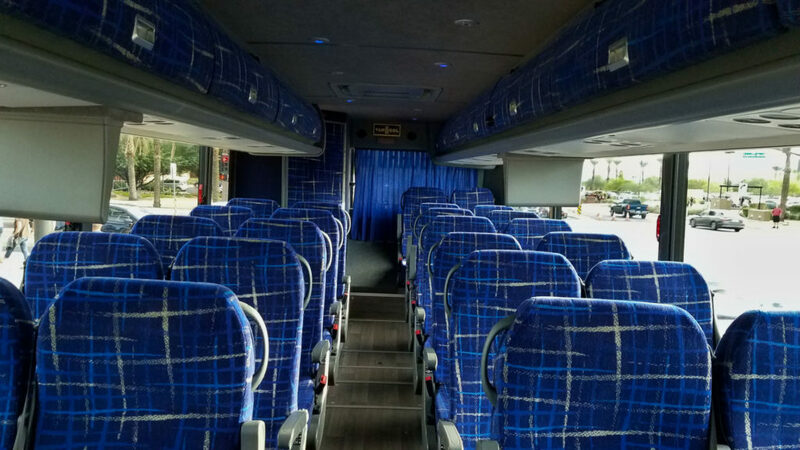 There are many options for transportation these days to get to a sporting event. 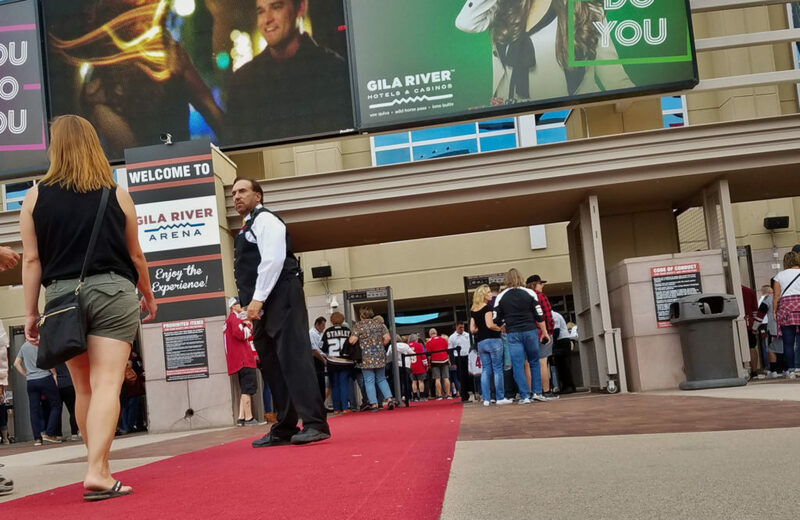 We choose to take a bus to the Gila River Arena. The bonus for taking a bus included not having to deal with finding a parking spot. I actually slept on the ride there and back. It was great. The bus delivered us about an hour early. Westgate has a large center surrounded by restaurants and the arena. 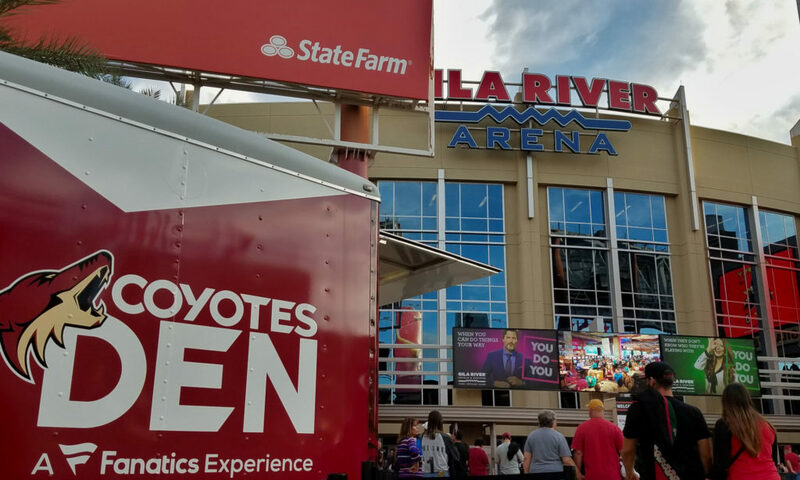 Outside of the hockey arena there were additional food trucks. They set up a red carpet for people to walk down to enter the arena. There was live music and a large Arizona Coyote blowup to take your selfies at. There is a table in the area where you show your ticket and the representative will put a wristband on you. This allows you to show your wristband to receive the food and drinks. 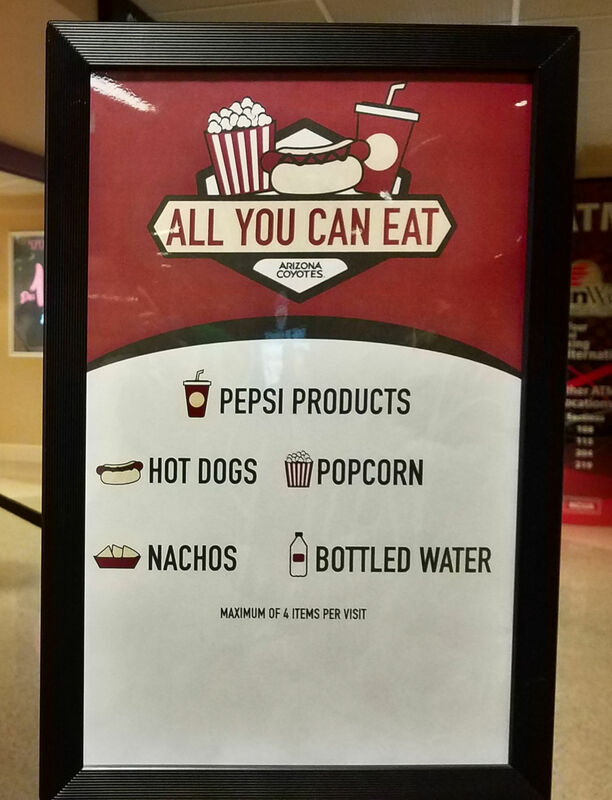 We were in the all you can eat seats which included unlimited access to Pepsi products, hot dogs, nachos, popcorn, and water. You get to pick up to 4 items at a time and they provide a tray to carry it all on. This was the way to go on price especially if you like to purchase food and drinks at a game. 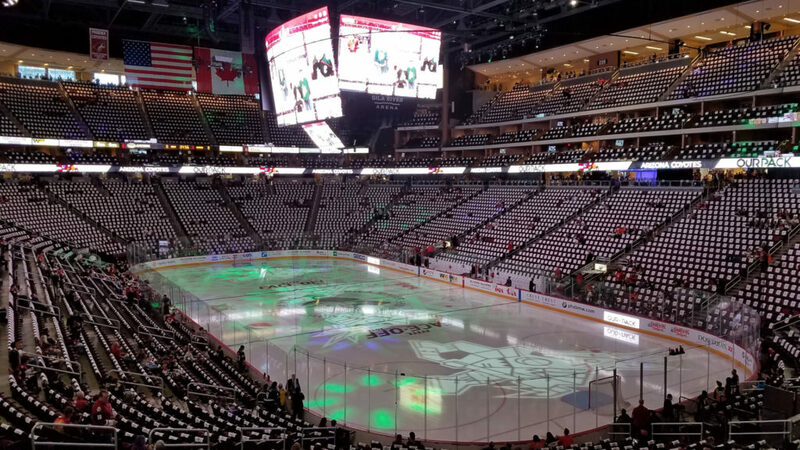 When we found our seats, there were mini towels with the Arizona Coyotes Hockey logo at each seat. The game started at 6pm with the introduction of the team members and the national anthem. It lasted a few hours and ended with a loss of 0-1. We highly recommend reserving the All-You-Can-Eat Seats. Have you attended a sporting event while traveling? If yes, what sport was it? I love hockey!! All you can eat seats would be my choice! Looks like a fun place to watch hockey! I am from Minnesota, so I sometimes forget that warm weather states like hockey, too. (Plus a lot of Minnesotans live down there in the winter. 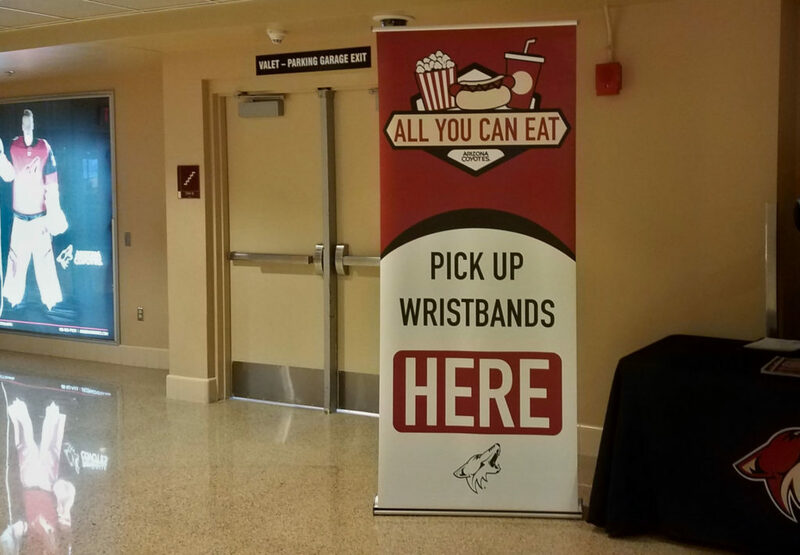 🙂 ) I like the idea of the all you can eat wrist band…concession prices really add up! I love the all you can eat seats but I know I would regret it! Sounds like fun – and the all you can eat is a great option. Seems like we always end up buying at least popcorn and drinks at games and they are so expensive!!! So much fun! I love hockey!